Celebrate that butterfly or spring theme! Every guest who attends your event is sure to appreciate these adorable compact mirror party favors which are practical and pretty! 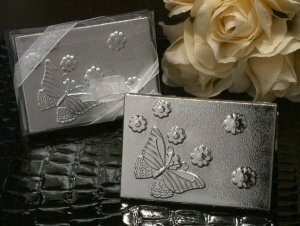 Their shiny silver finish features an embossed butterfly and flower design. The two piece compacts measure 3" x 2.5" and are individually packaged in a clear gift box with organza ribbon around the outside, making for ease of presentation.